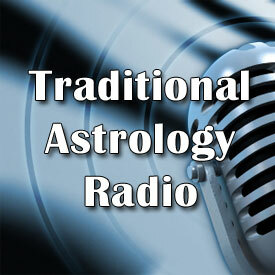 During this podcast I reflect on some areas of the tradition that I’ve been researching over the course of the past year, and I provide some news and updates about important developments that have taken place in the field of traditional astrology in the past few months. This is a solo show with no guests. The death of astrologer Alan White. For the previous interview I did with Alan last year see this page. There is also a memorial page set up on the Solsticepoint website. 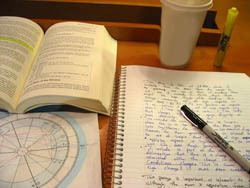 The AFA conference on traditional astrology that took place in September. My work in reconstructing the original Hellenistic aspect doctrine. Some issues with the four elements and the temperament theory. A research project I did this summer on the Ruler or Master of the Nativity. A lecture on the history of astrology that I’m giving in San Francisco next week. Thinking about moving off of BlogTalkRadio and soliciting advice from listeners regarding podcasting. Chris, this is a great podcast. I particularly enjoyed the part about the elements. I have a question in that regard: in the Bram translation of Maternus’ Mathesis there is frequent reference to watery, earthy, and fiery signs, despite no explicit delineation of triplicities in elemental terms. Is this a mistranslation by Bram? There is no reference to airy signs, but there is reference to human signs. Is it that Bram is mistranslating aquatic signs (which are not the same as our water sign? This comment is a little older, and I’ve since acquired the Holden trans. of Mathesis. I see reference to “earth signs” and “water signs” in there too (p. 370, para. 1), and similarly in the section on Mars in Book III (p. 114-115) in which “fire signs”, “water signs”, “terrestrial signs”, and “human signs” are referred to. It’s unclear if by human signs the broader category including Virgo and half of Sag. is included, or just the air signs. Thanks Anthony! When I read through Firmicus during the course of researching which authors applied elements to the zodiac the strongest evidence that I found that Firmicus seemed to employ the same scheme as Valens was in book 2, chapter 16, which is the chapter where Firmicus gives the qualities of the signs. Unfortunately this chapter is quite corrupt, so only parts of the descriptions for Aries and Pisces remain. However, Firmicus does call Aries a “fiery” sign, and he also calls Pisces a “watery” sign. Now, we have to be kind of careful with Pisces since it is the sign of the fish, but otherwise I see no reason for him to call Aries a fiery sign if he is not following the same rationale as Valens. It is too bad that the rest of the signs are missing, as they would have clarified the issue completely. The other examples you cited probably reenforce this conclusion for the most part, although we have to be careful because there was an alternate tradition of calling some signs watery or what have you based on a different rationale, and sometimes it wasn’t clear to me which approach Firmicus’ sources were using in those passages. Some of the delineations for death by water or fire that you cited on pages 114-115 of Holden sounded very similar to Valens’ delineations for violent deaths depending on the element that the relevant significators are placed in. So, I think that Firmicus probably was following that rationale, although the evidence is still pretty skimpy. Thanks Chris. Very interesting and thought provoking. Fascinating to hear more on your reasearch into aspect theory and the Master of the Nativity. However, I found you comments on the elements and the qualities especially interesting. The suggestion that Stoic theory fits the elemental associations better than the Aristotlean theory is intriguing. However, I do think a better defence can be made for an Aristolean position. One important point is that Aristotlean associations are dual not singular as with the Stoics. So in the Aristotlean outlook fire is hot +dry, air is hot + moist, water is cold +moist and earth is cold + dry. Its quite true that looking at Aristotlean theory the conflicting element of fire is water and the conflicting element of Air is Earth. These elements have nothing in common. Superficially, it looks like the arrangement of zodiac signs better fits a Stoic approach with fire (hot) opposing air (cold) and water (wet) opposing Earth (dry). However, the Aristolean outlook is more subtle than it initially appears. Both fire and water have something in common in Aristotlean theory. They are both hot! Plus we know the air and fire signs are both masculine. Rather than seeing the signs across the zodiac as totally contradictory the Aristotlean would be more likely to focus on their commonality and see this in a cyclical way like Aristotle. Aristotle suggests the elements can change into one another. Air (hot and moist) comes to be out of fire (hot and dry) by moistness overcoming the dryness of fire. Water (cold and wet) comes from the air by air’s heat being overtaken by cold. Earth (cold and dry) comes from water from dryness overcoming wetness and fire from earth by heat overcoming cold. This process is made possible because only one of the two qualities has to change in this transformation. Ultimately, the Stoics, Platonists and Aristotleans all had to fit their preferred humoural theory on to an established arrangement of the zodiac by triplicity. It would be very interesting to have more of Galen’s texts translated. He was living in the same century as Ptolemy and Valens and makes explicit references linking the elements, humours and temperaments. He unndoubtably worked from an essentially Aristotlean perspective. Sorry just need to correct an error above. The entire text is based on this notion of opposites, and it is for that reason that I think that if it had been an Aristotelian who had assigned the elements to the signs, then they would have made it a point to ensure that the correct signs were literally opposing each other in the zodiac. It would have been the perfect scenario to apply Aristotle’s assignments in practice. This might be the reason why someone like Ptolemy would tend to avoid mentioning the elements within the context of the signs though, even though he otherwise does use the doctrine of temperaments as applied to other parts of the system. I agree that it would be nice to have more translations of Galen. I’ve tried to collect what was available over the past few years, but there are still a few interesting looking works that haven’t been translated yet. There was a nice volume that contains several translations that was published in early 90’s, but it has been out of print for a while now for some reason and it is kind of expensive on Amazon. Thanks for this discussion, Chris and Mark. I’m happy to see that other astrologers have given serious thought to the triplicities and elements. I know you have collaborated with Benjamin Dykes a lot. Have you ran your theory by him? It would be very useful to have a trained philosopher look at this as the issue is as much more philosophical as astrological. The dualism you refer to is certainly there but without some commonality there can surely be no change and transformation in the sub-lunar realm? One reason Ptolemy may have avoided reference to elements is that it would have made his system of qualities assigned to planets and signs unworkable. Essentially in the 2nd century CE we have three models of applying qualities to signs from Galen, Valens and Ptolemy. Galen’s model which emerged from medical astrology became the medieval and renaissance orthodoxy. Hence fire is hot and dry, Air is warm and moist, Earth is cold and dry and Water is cold and moist. From my research it seems clear that neither the Galenic or Stoic approach work that well if you look at the planetary rulerships. The Galenic system is the least successful but the Stoic isn’t much better. If you look at the Stoic approach the signs of Taurus and Scorpio pose real difficulties in terms of the qualities of the signs and their planetary rulers. In particular, the planets of domicile, detriment, exaltation and fall make absolutely no sense in comparison to the Stoic qualities assigned to the signs. The ‘moist’ planet Venus doesn’t really fit as ruler of Taurus if it is a ‘dry’ sign. Equally, why would ‘dry’ Mars be in detriment there? Why is the ‘moist’ Moon exalted in Taurus? Same problem in Scorpio. If we want a system of qualities to match the planets and signs we need to adopt Ptolemy’s approach and abandon the notion of elements tied to triplicities altogether. I know its a high price for many but it appears the only logical way of making the planetary qualities approximate to that of the signs. I believe Ptolemy’s system is far more successful than either that of Valens or Galen in matching the nature of planetary rulerships to the quality of the signs. Hardly, surprising really as Ptolemy makes the quality of the signs match their planetary domicile ruler! Thank you Chris. I was fascinated to hear about the four humours and how the Stoics regarded the air triplicity as cold. That was a real light bulb moment for me because since studying traditional astrology I have been unable to cope with air being warm and moist ! This made me even more interested in the stoic astrologers especially Vettius Valens. I believe their world view is still relevant today even in our “have it all” modern age. I also was very interested in hearing about the master of the nativity and what you said about a daemon being with us. I have personal experience of this and believe that a daemon takes us through our lives, for good or ill, according to our charts.